Arrive at Montreal’s international airport today, and meet your driver for private transfer to your downtown hotel. Your next two nights will be spent at the spectacular Fairmont The Queen Elizabeth, which is located within close proximity to all of the food, culture and adventures one could desire while staying in Montreal. The remainder of the day is free to begin your explorations of the city. Overnight Montreal. 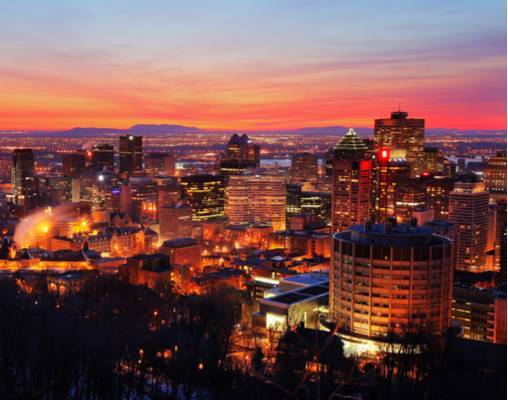 The day is yours to see Montreal as you wish, the options are truly endless. Stroll the cobblestone streets and many shops of Old Montreal, spend a relaxing day at a Nordic spa, or taste your way through the city by exploring Montreal's vibrant dining scene. 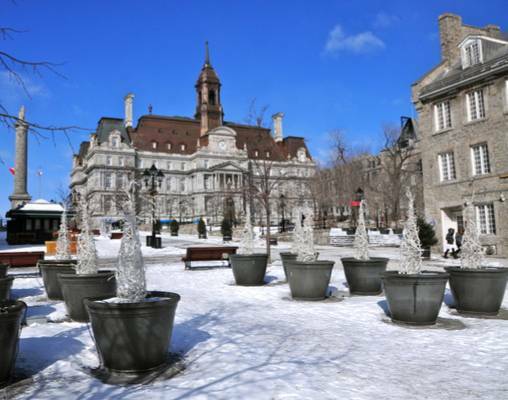 For those looking for an outdoor adventure, perhaps visit one of the many ice rinks throughout the city for a day of skating or check out the seasonal festivities at the Place Jacques-Cartier in Old Montreal. An optional sightseeing tour is available on select days. Overnight Montreal. Enjoy views of the frozen landscape as you move by train between Montreal and Quebec City. This journey is just under 4 hours in length, leaving ample time to get acquainted with the city upon arrival. As the train pulls into the Quebec City station, transfer on your own to the castle-like Fairmont Le Château Frontenac - a destination in and of itself and your hotel for the next 3 nights. The remainder of the day is at leisure. Overnight Quebec City. Today, tour one of the most unique structures in North America, one that changes each year and can only be seen during the winter in Quebec, the Hotel de Glace. 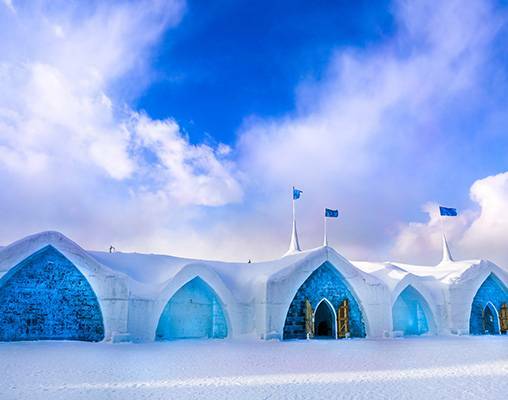 Constructed entirely of ice and snow, this hotel features intricately carved sculptures and decorations, themed guest rooms, a stunning chapel and two impressive ice bars. 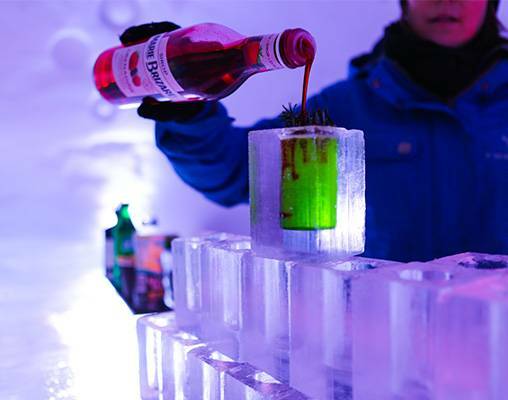 During your tour, a guide escorts you through the many rooms of this remarkable structure until you reach the bar, at which point you can enjoy a cocktail in a carved ice glass. Return to Quebec City, and spend the rest of the day enjoying the sites independently. Overnight Quebec City. 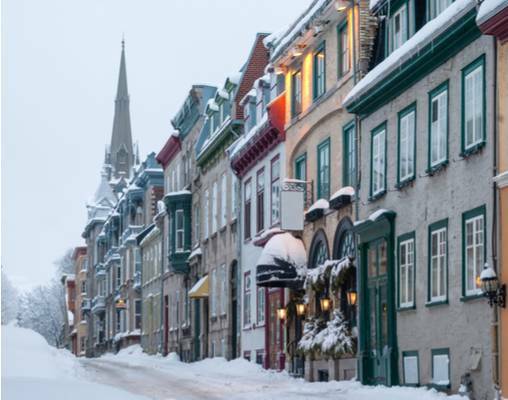 The charm of Quebec City is on full display as you continue your explorations independently. Fill your belly at a local restaurant with Quebec’s favorite dish, poutine, or enjoy high tea at the Fairmont Le Château Frontenac. Spend the day traversing the snowy landscape on a dog sled or try your hand at ice skating, tobogganing or snowshoeing. There are numerous historic sites to be uncovered throughout Old Quebec and, paired with the undeniable European essence of the city, you may never want to leave. Overnight Quebec City. Make your way to Quebec City’s train station to board your VIA Rail train bound for Montreal. Take a moment to appreciate the vistas as the architecture of Quebec City fades into the distance and the snowy countryside comes into view. As the train pulls in to Montreal’s rail station, transfer back to the Fairmont The Queen Elizabeth. Spend the rest of the day enjoying the diverse atmosphere that surrounds the city or enjoying the spa amenities of your hotel. Overnight Montreal. 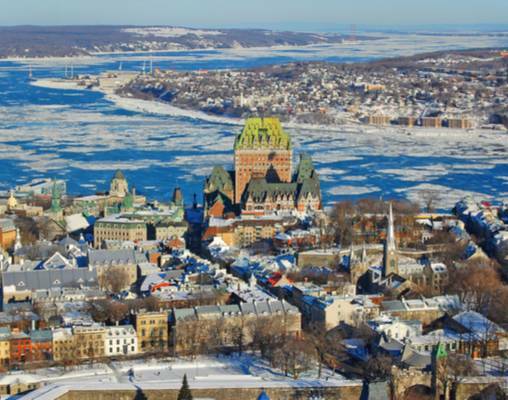 Hotels include Fairmont the Queen Elizabeth, Montreal and Fairmont Chateau Frontenac, Quebec City. VIA Rail accommodations are in business class and include a seat with picture window, access to the in-station Panorama Lounge (where available), priority boarding and complimentary newspapers. Enter your details below if you would like to be notified when 2021 dates and prices are available for Quebecois Holiday. Prices are correct at the time of publication, however are subject to change at time of booking. Hotel and Rail accommodations listed above, are subject to change based on availability at the time of booking. 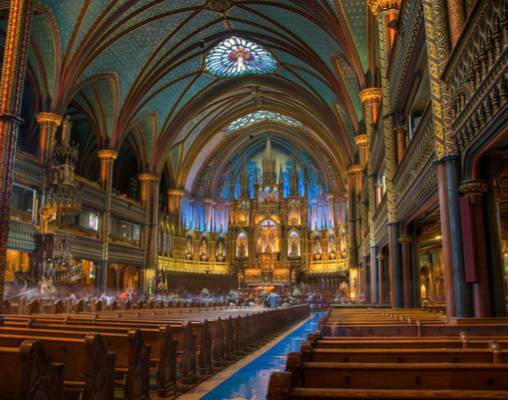 Heart of Montreal Motorcoach tour does not operate Mondays and Tuesdays January 6 - March 23. Pricing has been reflects the removal of this tour. Taxes are not included on rail portions and are subject to change.